Tyson Fury moved a step closer to a world-title fight with one of the Klitschko brothers after stopping Vinny Maddalone in their WBO Intercontinental heavyweight contest in Clevedon on Saturday night. Fury, 23, easily improved his 19-fight unbeaten run with a fifth-round technical knockout after the referee stepped in with blood streaming out of a cut under the veteran American's left eye. 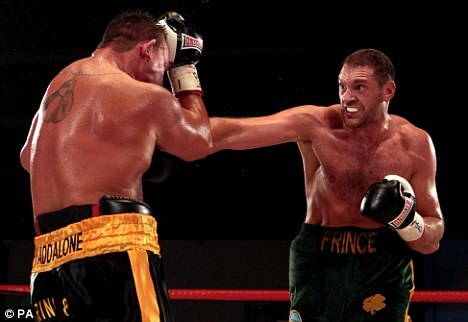 Fury has been earmarked by the Klitschkos as a possible opponent, although the former British and Commonwealth champion has stated he would wait until he had earned a mandatory fight before taking on the all-conquering duo. In front of a worldwide audience tonight he had too much class for New Yorker Maddalone, landing a couple of heavy punches in the opening round to immediately stun his opponent. It was all one-way traffic thereafter with another right-hander from the 6ft 9in Fury opening the cut under Maddalone's left eye in the fourth round. The American battled on but, with Fury indicating he wanted the fight halted, the referee eventually stepped in to end the contest midway through the fifth. 'I knew it was a matter of time. 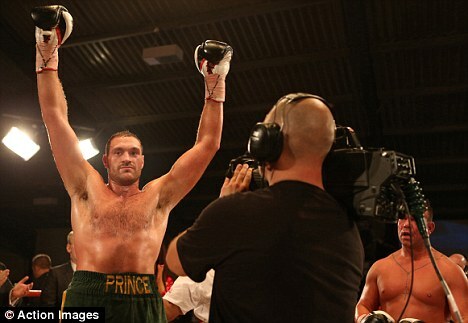 I actually called the referee over, he was taking some big shots,' Fury said in an interview on Channel Five. 'I'm still undefeated. I would like to say I'm ready for anyone in the world. Klitschkos: bring them on. Americans: bring them on. Promoter Mick Hennessy played down any thoughts of a Klitschko fight in the near future, before hinting Pole Adamek was next on the agenda for Fury. 'It (a Klitschko fight) is getting closer. We're still one fight at a time. He's 23. To pull off a result like that tonight was unbelievable. That was a masterclass,' he said.